istanbul39 wrote: The most fantastic museum I have ever been to is the war Museum and Anitkabir in Ankara. In one section, you walk through a simulated Geibolu. Absolutely amazing! The sound system gives you the sense that bullets are whizzing past your head and the mortar exploding at your feet. You can walk through the medic tents as the Red Crescent attend to the wounded. Make your way to the attack hills and hear the "Mehmets" chanting "Allah, Allah, Allah..." as they go find their bullet. Can not visit there enough. Excellent! I have also been through the Australian War Memorial in Canberra where this is also a whole section devoted to Gallipoli Campaign, but i guess largely from the ANZAC perspective. istanbul39 wrote: I'm sure nothing you have not seen already but this is an interesting web site. No i had not seen this document/site. Thank-you for that. I am far from happy with the map. There are aspects of it that i would like to enhance and improve greatly. The main battle concern is that the xml doesn't allow for natural decay to neutral for the batteships. Here's hoping! captainwalrus wrote: for the past two versions, the map isn't showing up at all. captain, it must be your browser/software somewhere. all the other versions worked fine. I got firefox and I can finally see the last few updates. It is looking really good. The shadow is a little much on the impassibles at the edge of the peninsula but I think that the other ones should be a little darker. Its looking like the 'decay to 0' is way beyond the horizon at the moment. With the objective being tricky it may be worth investigating some way of attacking the battleships - maybe something with a reasonably-sized neutral so that your original gameplay-idea for the battleships would still happen. DJ Teflon wrote: Its looking like the 'decay to 0' is way beyond the horizon at the moment. Mmmmm. with the Turks not having firepower that could hit the battleships, i am reluctant to introduce anything other than what happened less it make it NOT Galipolli. If the mapmaker wants to continue this map, a CA will move the thread back to the main foundry after an update is posted. How about bringing this back with supersize? Bruceswar wrote: How about bringing this back with supersize? Bruceswar...i think IndustrialHelix had taken over this map and had started doing something on it...but we're waiting on lackattack to do something for the XML so that the battleships can reduce to nil by 1 per round. Having said that, i believe there may be another solution with the losing condition for the xml regardless of the battleship armies. What's the word on this one? IH has indicated he does not want to carry on with it, and since the graphics require some work on mountains and ridges, the gameplay is almost sorted. Previously we had no xml for the battleships as discussed above, however, that can be changed (as advised by Sully) to having the battleships as a losing condition...so players must ensure the battleships stay in play. As soon as it is moved, i will start discussion and work on it. thenobodies80 wrote: If the mapmaker wants to continue this map, a CA will move the thread back to the main foundry after an update is posted. Once this is done then it can be moved. i'd say the graphics require some work on everything. a fresh start would probably be best. this map looked mediocre for 2009. 3 years have passed since then. i'm sure 2009's mediocre graphics surely won't be sufficient for 2012.
you are of course entitled to your opinion, i happen again to disgree with you as usual. so you're telling me you honestly believe this latest version is up to par with the current graphic standards? oh well, if that's the case then i guess i can dig up some of my old maps. termitarium could work. i'll just work on some ridges and off to beta with it. One of the notes i had made to self back then, was to insert Ari Burni as a territory. Ari Burni, is the point at the north end of Anzac Cove. I simply don't think there is enough space to do this. From the perspective the map is already at its required small size, i don't want to increase it to supersize. cairnswk wrote: One of the notes i had made to self back then, was to insert Ari Burni as a territory. Ari Burni, is the point at the north end of Anzac Cove. I simply don't think there is enough space to do this. Is this historically important or game play important? it was historically important and i think someone wanted it as it was the site of the Dawn service until 2000 and it is the site of a cemetary. There are many areas that are gameplay and historically important but not all can be included obviously because of space. 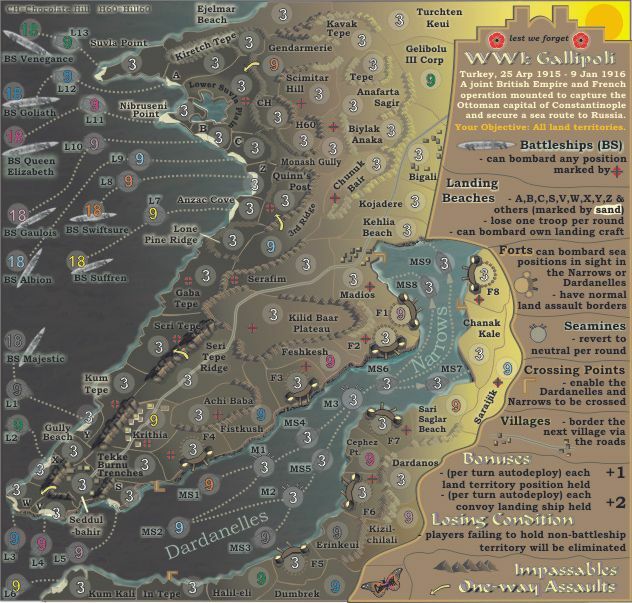 The design of the map was to include the Anzac section but to give an overall gameplay scenario for the invasion of the Peninsula...thus players have an opportunity to do the reverse of what the historical outcome was. 1. New Losing condition - Players failing to hold non-battleship territory will be eliminated. 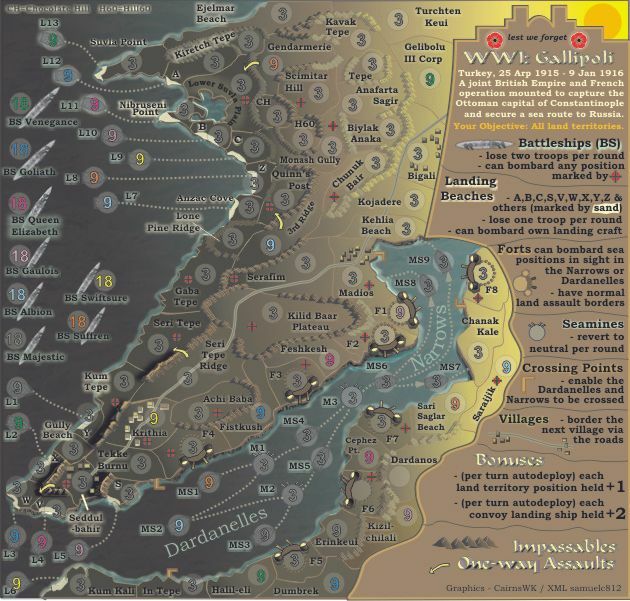 This allows battleships to use their starting numbers for invasion, but since the Turks could not reach them with battery fire from shore, it keeps them in play, but demands that players can be eliminated without them anyway. 2. Moved some connections around for the battleships to landing craft. 1. Landing Beaches can only bombard landing craft? if yes you have to change your connections between battleships and land because one way attacks have a different arrow. 2. The objective: all land territories. Really? I think it's impossible! If I'm able to hold all those regions I shold have the power to annihilate the opponent in other ways...i think no one will try that objective. oh, btw...last question do you want this one moved back or it's just "testing ground"? OK, good point. i'll remove that... and see if anyone has any other option for an objective, or if we need one at all. yes please move this back. And while i am at it...a question...since the foundry is really slow at present from the lack of movement in FF -> Beta, do you think it would be appropriate to extend the update period from one month to two months? [Moved] due to an update being made! Welcome back cairns!! As for the update time frame, that'll be a tnb question. isaiah40 wrote: [Moved] due to an update being made! Welcome back cairns! !